The tax service provides online payment system for tax payers and enterprises. It also provides online self-service including information query, download and FAQ, etc. 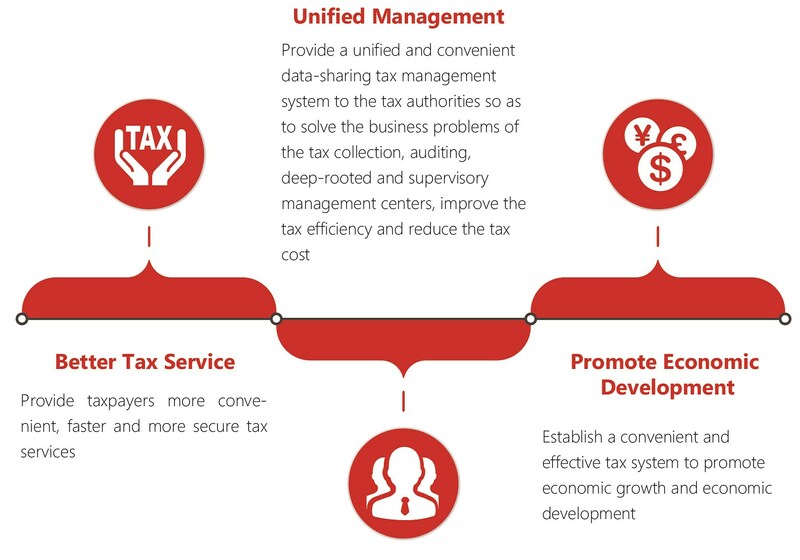 Tax management helps governments to manage tax affairs, including tax declaration and collection management, tax payer information management, invoice management, etc. Administration management helps tax management departments with their workflows, working documents, internal affairs, information service and work supervision, etc. Decision making support for the modern tax management needs, and helps the tax departments to make better tax or policy decision and detects risks with more precise analysis by data mining, analysis and visualization to detect trends and predict outcomes. To work better with inter government agencies, GSAFETY provides data interface and data sharing platform to make data exchange with other systems and agencies, such as Department of Finance, banks, Public Safety and Securities agencies, etc. GSAFETY can help clients set up a tax management system structure for government tax departments and agencies. Building one unified platform for all users, both internal and external. Helping government departments with different jurisdictions manage their own affairs and also coordinate with each other. Covering all tax categories and serving all departments and tax payers. COPYRIGHT (©) 2019 GSAFETY - Make safety a reality.